Seizures are a common occurrence in patients with a life-limiting illness. The assessment and management of seizures in the palliative patient require the interplay of many factors, including patient and treatment goals, counterbalanced with the need to maintain quality of life. Throughout this chapter, the reader is provided with current evidence regarding definitions, classification, assessment, and management of seizures. Antiepileptic medications are discussed in detail, with an emphasis on the administration routes, commonly used in the palliation population. Current concepts regarding status epilepticus are outlined, including pathophysiology and management. 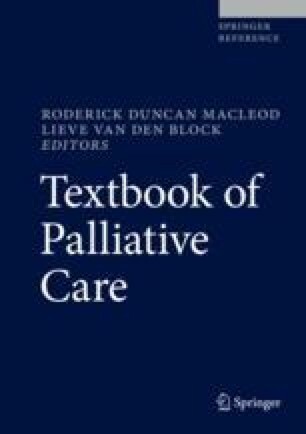 The chapter concludes with a comment on seizures, driving, and the palliative patient. Cancer Institute NSW. Brain tumours and driving: a guide for clinicians [Internet]. Cited 2016 Oct 15. Available from: https://www.nsa.org.au/documents/item/48. Sykes L, Wood E, Kwan J. Antiepileptic drugs for the primary and secondary prevention of seizures after stroke. Cochrane Database Syst Rev. 2014;(1):CD005398. https://doi.org/10.1002/14651858.CD005398.pub3.